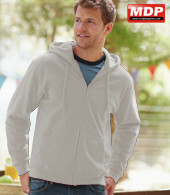 Zip Through Hooded Sweat with narrow covered zip for enhanced printability. 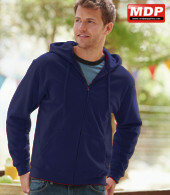 Double fabric hood with self-coloured draw cord and single jersey back neck tape. Two front pouch pockets. 80% cotton, 20% polyester. 280gm. Pack pricing for Zipped Hoodies is for 6 garments in the same colour and size.